Distress because of difficult life experiences and circumstances eg bullying, relationship issues and stress. Mild-moderate mental health eg depression/low mood, anxiousness and anger. 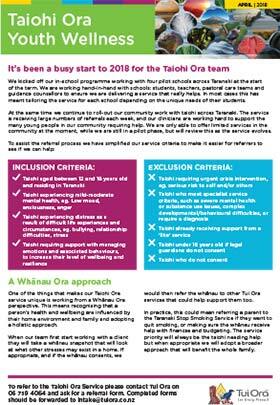 Taiohi requiring support with managing emotions and associated behaviours to increase their level of wellbeing and resilience. To make a referral download the form here and return to Tui Ora via email intake@tuiora.co.nz or by returning it to 36 Maratahu St, New Plymouth 4310. For further information phone 0508 496 884, phone (06) 759 4064 or see the newsletters below. For further enquiries contact the service on 0508 496 884. To refer, please complete the referral form (available above). It is preferable if the referral is completed by a health or other community professional to ensure all relevant information is provided. A letter of acknowledgement is sent to the referrer on receipt of referral. The referrer will be informed of the outcome of their referral.